Zagster’s location in the Cambridge Discovery Park complex parking garage and other sites across the nation currently use a key to unlock/lock the U-lock on bikes. Zagster, a Cambridge-based bike-share company that wants to become the Zipcar for cyclists, is carving out a niche outside large cities. Unlike city-sponsored programs like Boston’s Hubway, with thousands of bikes, Zagster makes its money by leasing smaller numbers of bikes to companies and colleges, as well as towns and smaller cities. Early next week, the company will announce its latest innovation. 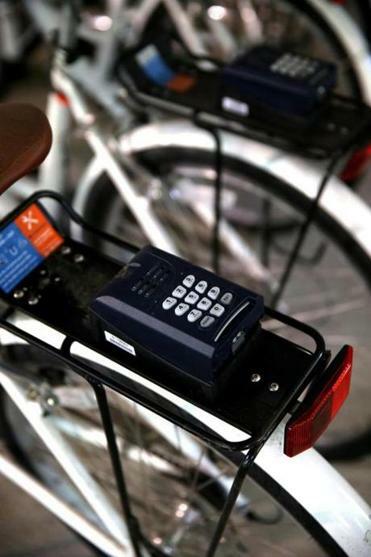 Billed as a first in North America, Zagster will soon start outfitting its fleet of 2,714 bikes in 130 locations nationwide with Bluetooth-enabled locks that can be operated with the tap of a smartphone. In Massachusetts, there are 87 Zagster bikes at eight stations, including at a CBRE/New England office in Burlington, University Park at MIT, and the Cambridge Discovery Park. “What we are seeing around the country, and we hope to replicate here in Boston, as well, is really creating this network that surrounds the city because our solution makes sense for the Maldens, the Arlingtons, and other towns surrounding the major metro areas,” said Timothy Ericson, Zagster’s chief executive. Investors are buying in, with $8 million in venture-capital dollars raised so far. Though Ericson declined to release exact figures, he said revenue increased 300 percent this year. Here’s how it works: Zagster leases the bikes, provides software, and contracts with local mechanics to patch up flat tires and pop on off-track chains. In return, customers pay a set amount, usually around $135 per month per bike. Many corporate clients then offer use of the bikes free of charge to riders. The traditional bedrock of the bike-share business, municipal programs such as Boston’s Hubway and New York’s Citi Bike, require thousands of consistent riders. And unlike Zagster, the bikes must be purchased upfront. Catering to individual companies does come with its own set of challenges, said Ryan Rzepecki, chief executive of Social Bicycles, a bike-share company based in New York that has more than 5,000 bikes in the United States, Canada, and Australia. It doesn’t make much sense for Zagster to go after a slice of the big city market because it’s already claimed. In Boston, Hubway has 1,600 bikes, and Citi Bike has 8,000 bikes throughout New York’s boroughs. Instead, Zagster has a municipal program in Carmel, Ind., and another in Albuquerque, among others. In May, it began supplying 125 bikes to the University of Maryland. Though Ericson downplays competition, Zagster has some, though most work differently. Rhode Island-based OnBikeShare has doubled in size over the past year, according to Patrick Perugini, president of OnBikeShare's parent company, Dynamic Bicycles Inc. The company has grown to about 2,000 bikes used by 100 clients in 30 states. OnBikeShare sells its bike-share systems to clients, unlike Zagster, which leases and maintains them. The Rhode Island company’s clients have to care for the bikes. Zagster has inked deals with a number of big-name corporate clients, including Needham-based TripAdvisor and General Motor Co.’s 19,000 employees at Warren Technical Center in Michigan. The bikes have reduced traffic congestion on the 1-square-mile campus in Warren, according to Peter Kosak, GM’s executive director of urban mobility. “We knew that if we could provide a way, in better-weather months, for people to get around campus and not have to go out to their vehicle and hunt for a parking spot, then we could provide a better option to get around,” Kosak said. For landlords, bike-sharing as an amenity was merely “something we were thinking about” as recently as five years ago, said Tina Snyder, marketing director for Bulfinch Cos. It owns Cambridge Discovery Park, an office park that’s home to companies such as Forrester Research and Genocea Biosciences Inc. In 2013, Bulfinch hired Zagster to provide bikes for its 30-acre campus. Michael Bodley can be reached at michael.bodley@globe.com.